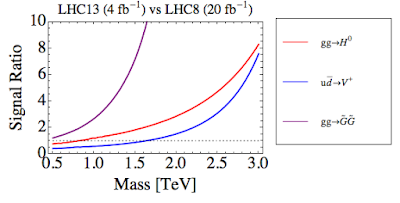 We see that, for processes initiated by collisions of a quark inside one proton with an antiquark inside the other proton, the cross section gain is the least favorable. 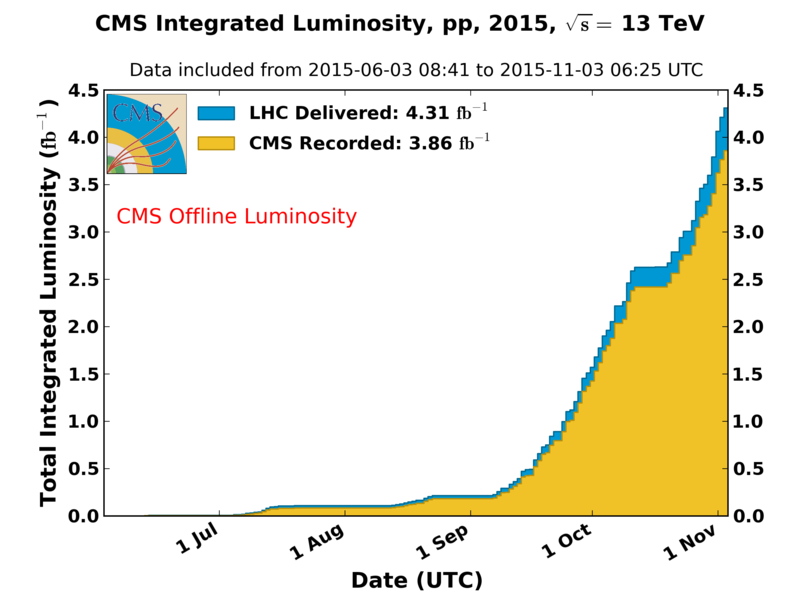 Still, for hypothetical resonances heavier than ~1.7 TeV, more signal events were produced in the 2015 run than in the previous one. For example, for a 2 TeV W-prime resonance, possibly observed by ATLAS in the 8 TeV data, the net gain is 50%, corresponding to roughly 15 events predicted in the 13 TeV data. However, the plot does not tell the whole story, because the backgrounds have increased as well. Moreover, when the main background originates from gluon-gluon collisions (as is the case for the W-prime search in the hadronic channel), it grows faster than the signal. Thus, if the 2 TeV W' is really there, the significance of the signal in the 13 TeV data should be comparable to that in the 8 TeV data in spite of the larger event rate. That will not be enough to fully clarify the situation, but the new data may make the story much more exciting if the excess reappears; or much less exciting if it does not... When backgrounds are not an issue (for example, for high-mass dilepton resonances) the improvement in this year's data should be more spectacular. We also see that, for new physics processes initiated by collisions of a gluon in 1 proton with another gluon in the other proton, the 13 TeV run is superior everywhere above the TeV scale, and the signal enhancement is more spectacular. For example, at 2 TeV one gains a factor of 3 in signal rate. Therefore, models where the ATLAS diboson excess is explained via a Higgs-like scalar resonance will be tested very soon. The reach will also be extended for other hypothetical particles pair-produced in gluon collisions, such as gluinos in the minimal supersymmetric model. 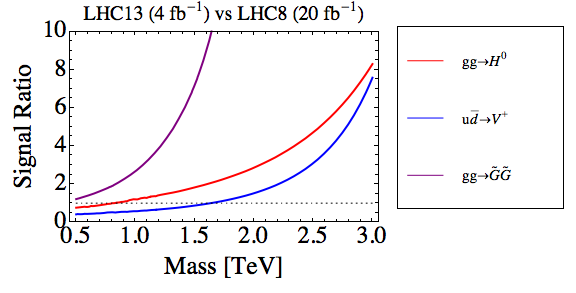 The current lower limit on the gluino mass obtained by the 8 TeV run is m≳1.4 TeV (for decoupled squarks and massless neutralino). For this mass, the signal gain in the 2015 run is roughly a factor of 6. 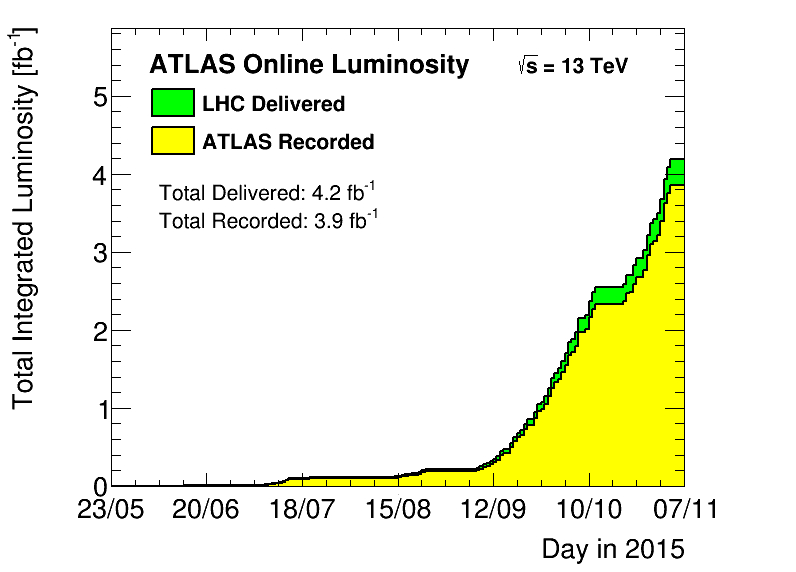 Hence we can expect the gluino mass limits will be pushed upwards soon, by about 200 GeV or so. Summarizing, we have a right to expect some interesting results during this winter break. The chances for a discovery in this year's data are non-zero, and chances for a tantalizing hints of new physics (whether a real thing or a background fluctuation) are considerable. Limits on certain imaginary particles will be somewhat improved. However, contrary to my hopes/fears, this year is not yet the decisive one for particle physics. The next one will be. So, what are the rumors about the new data? I haven't heard much yet. I guess the analyses with full 4 fb-1 have not been done yet. I suppose the rumors will start to emerge in the early November, before the CERN council meeting. Goes Googling for "Cross Section". Welcome back Jester. You were missed. @Chris: Oh come on. On average, every day several hundred people die in Paris. Do you plan to ask that question every day now? Don't get me wrong, it is horrible what happened there, but the risk to die in a traffic accident or similar is orders of magnitude higher. Concerning physics: I didn't see public results using more than ~100/pb so far, but analyses with the full dataset are in progress. That's right, statistically it would require a 3 sigma fluctuation to get killed that night. "Several hundred people" die daily of (presumably, unnatural) causes in just one of the dozens of major cities on this planet?! Just shows us how far we have yet to go, and not only in the filed of HEP. Is it so, though? Here in a million-size city in the Canada's East person's death is still not a routine, one-of-the-hundreds event. Hope it stays this way for a while (the longer the better, actually). I didn't say the hundreds die of unnatural reasons. Not-age-related deaths within a month still exceed the deaths from terror significantly, even if you consider Paris in November only.